Trinity students rally for higher education funding outside Department of Education. Photo by Eliza Meller for Trinity News. Students’ union leaders from across the country met with the Irish Universities Association (IUA) today to discuss higher education funding, Trinity’s student partnership agreement, and engagement between students’ unions and the IUA. Students’ union presidents from Trinity, University College Dublin (UCD), Dublin City University (DCU), University of Limerick (UL), Maynooth University (MU) attended the meeting alongside the Union of Students’ in Ireland (USI). Another meeting is set to take place in late April to identify the areas for cooperation with the IUA and the group’s goals moving forward. “We’re not interested, nor is anyone, in a talking shop, but rather to take value in the opportunity to discuss together the key issues on university campuses facing students, and how we’re going to address them together,” she continued. 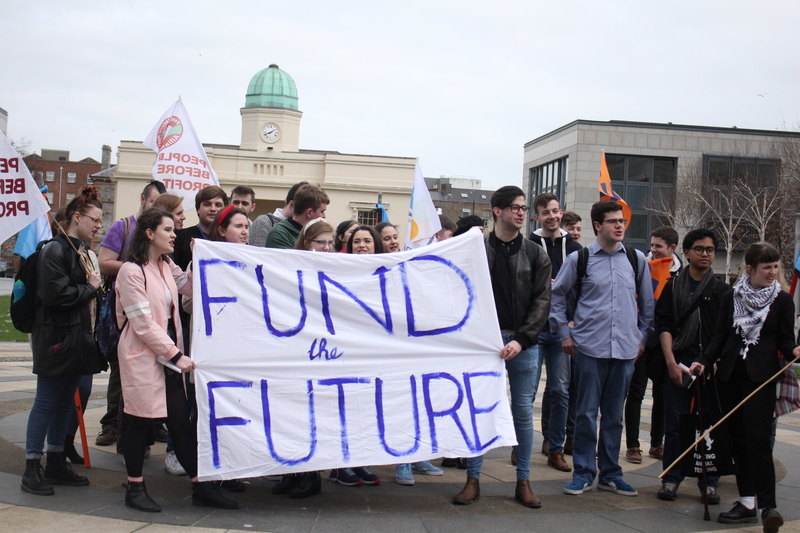 Yesterday, Trinity students joined a series of rallies as part of the “Fund the Future” campaign in a call for the government to take action on the future of Ireland’s higher education funding. The campaign addressed a number of key issues regarding student funding, including increases in fees, cuts to SUSI grants, and reductions to student services. De Rís outlined that the rally aimed to “show that we’re angry, and to show that we demand that the Government fund our future, and the futures of those that will come after us”. In October, IUA Director General Jim Miley called on Trinity students to “put pressure on politicians” and make higher education funding a political issue at a TCDSU town hall meeting.